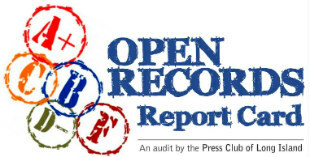 An unprecedented audit by the Press Club of Long Island on the responsiveness of 195 municipalities and agencies to New York State Freedom of Information Law requirements revealed almost two-thirds failed to respond to requests for public records before the deadlines set by the law while almost half did not provide a list of documents they’re required to maintain. And almost one-third of the villages did not provide a required written FOIL policy, although these policies are already in their municipal codes. The overall average grade that Long Island local governments and agencies received for FOIL compliance is a C.
The Press Club of Long Island has been working to break down recently erected barriers to basic Nassau and Suffolk county police information that is legally open to the public for review. The Press Club of Long Island and Society of Professional Journalists sponsored a free freedom of information workshop in Southampton, N.Y. on Wednesday.